Chiribiri is a clothing manufacturing headquartered in Carinaro outside Naples in the Province of Caserta (CE), Italy. It is currently a trademark of Global Corporation. Chiribiri began life as an engineering and automobile manufacturer in Turin in 1910 when the 45 year old Venetian Antonio 'Papa' Chiribiri founded Fabrica Torinese Velivoli Chiribiri & C., (Chiribiri Aircraft of Turin), along with associates Maurizio Ramassotto and the engineer Gaudenzio Verga. Antonio Chiribiri was born in Venice in 1865 but it was not a natural city for engineering so he moved to Florence to work in a small factory. He quickly moved on to Zust and then Isotta Fraschini as a technical specialist in automobiles. In 1909, he joined the aeronautical manufacturer Miller Aircraft in Turin and took charge of technical design. In 1910, he started his own company manufacturing spare parts and accessories for aeronautics, 'Fabrica Torinese Velivoli Chiribiri & C'. The company became known for the quality of its aircraft parts and grew to build at least one aircraft, the 'Chiribiri No. 5', 2 seater, tractor monoplane which flew in July 1912. It was 24 feet (7.3 m) long with a 31 foot (9.4 m)wingspan, weighed 770 lb (350 kg) and flew at 55 mph (90 km/h). But then Chiribiri was licensed to build 100 aeronautical motors for French engine manufacturer Gnome et Rhone, so aircraft production ceased. This success enabled Chiribiri to open a ‘flying school’ at the factory, training pilots who subsequently flew in the Great War. In 1912 a Fiat Chiribiri broke the world speed record for the timed kilometer from a flying start. This car, with a 7,000 cc engine producing 300 hp could reach 300 km/h, is now displayed in the Mario Righini collection at the castle in Panzano, Tuscany . Chiribiri started building production automobiles in 1914, when Gustavo Brunetta d'Usseaux, a rich land owner, commissioned the construction of 100 examples of the ‘Siva’ , a 980 cc economy car, but the financial side failed so Chiribri carried on alone. In 1915 they started a second production series with a larger chassis and 1300 cc, 12 hp (9 kW) engine, and continued throughout the war. At the 1919 Paris Motor Show Chiribiri launched the 'Milano' open bodied, 4 seater, 1593 cc, side valve, 12 hp model that remained in production until 1922 when it was replaced by the 100 km/h ‘Roma 5000’ (Touring and Sport versions) with a 1500 cc, twin overhead cam, engine producing 25 CV engine at 3,200 rpm. This was in turn developed into the 'Monza', either as a four-seater torpedo bodied tourer or as a 'Monza Corsa' for competition, eventually with a supercharger. The racing debut of the Monza GT model in the hands of Ada Chiribiri, Amadeo Chiribiri, Tazio Nuvolari, Gigi Platé and I'inglese Scalese 'the Englishman' Jack Scales (Jan 29 1886-Oct 23 1962) brought three victories in the Susa-Moncenisio race, the Aosta-Gran San Bernardo race and the Voiturette GP at the Monza autodrome. In 1921 Amadeo Chiribiri, racing under the pseudonym of Deo, won the 'Coppa della Cascine' in Florence and Mauro Ramassotto came second in the 2,000 cc class of the Rome Criterium. In the 1922 2nd Grand Prix of Penya Rhin (Barcelona) at the Circuit de Vilafranca, a road circuit in the hills behind Sitges, Mauro Ramassotto finished 3rd and Amadeo Chiribiri set the fastest lap (112 km/h) for 'Voiturettes' up to 2000 cc. In the 1923 3rd Grand Prix of Penya Rhin (Barcelona) at the Circuit de Vilafranca Tazio Nuvolari was 5th in the 1500 cc Chiribiri, and in the II Spanish Grand Prix at the banked Autodrom Sitges-Terramar, he finished 4th. 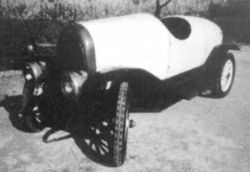 In 1924 Alete Marconcini was Italian National Champion driving a Chiribiri 12/16 to 3 victories in the Circuito del Belfiore, the Circuito di Cremona and the Circuito del Montenero. Additionally Tazio Nuvolari won the Circuito del Savio and the Circuito del Polesine, whilst Rodolfo Caruso won the Coppa della Perugina. In 1923 a road version was released with either a 45 hp (33 kW) engine or a new 65 CV (48 kW) version using 5,000 rpm. 2 years later a supercharger was added, delivering 95 CV (70 kW) at 5,700 rpm, and achieving 180 km/h. In 1927 the company diversified into diesel and industrial engines. In 1925 the company was revamped and the name was changed to Auto Costruzioni Meccaniche Chiribiri but sales of road going vehicles were never high, due in large part to the poor performance of the side-valve Milano with its higher 'aeronautical' engineering quality standards necessitated higher pricing. So, despite the 1927 venture into diesel and industrial engines, when financial depression hit Europe the company closed on 3 September, 1929, with its assets being sold to Lancia. Antonio Chiribiri died in April 1943. Amedeo, his son born in 1898, and Ada his daughter, had been his closest collaborators and team members, having won races, hill climbs and rallies. Official Chiribiri (clothing) web site with images of Chiribiri cars and film of Nuvolari driving (mostly) Alfa Romeos and Auto Unions.